Playing as a Native American with a tomahawk, scalping British soldiers during (presumably) the American Revolutionary War. Now there's a direction that I can't remember video games ever taking. Kinda makes you wonder what a Nintendo adaptation of The Last of the Mohicans would have been like, huh? Thanks to good friend Drew McOmber for spotting this! The Assassin's Creed games are pretty good, although the first game is just alright. The rest of the games are huge improvements over the first. They have a pretty interesting sci-fi alternate history storyline to them involving the Knights Templar. The first game had you playing as an assassin during the Third Crusade. 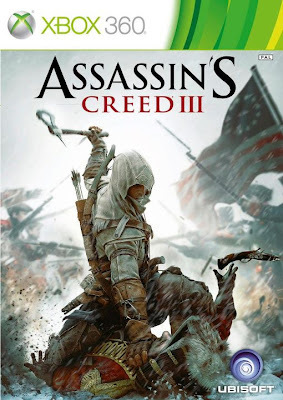 The second game, along with AC: Brotherhood, and Revelations had you playing as an assassin in Renissance Italy, and you interacted with historical figures like Leonardo Da Vinci, Machiavelli, and Copernicus. You should try to check them out.